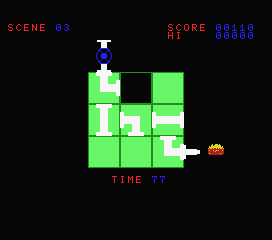 The MSX-BASIC 2012 Contest organized by Konamito.com provides us a second finished game, 9 days before the deadline ! 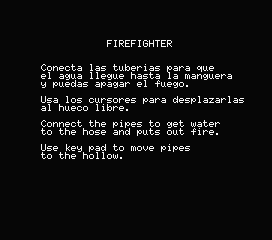 Firefighter is another puzzle-game, created by the Spanish coder Pentacour, who challenges us in 15 still more difficult levels where a fireman needs to connect first correctly the pipes before getting water to the hose and being able to put out the fire. Your time is limited, an option “Continue” is available but you will lose points if you need to use it.